Being headless is never easy. Clothes just don't fit right. You can never wear a hoodie or a baseball cap. Plus, all that coagulating blood is messy. No one wants to stand too close to you for fear you will drip on them. They say kids can be so mean, but try walking down a school hallway without a head. If you thought someone calling you 'Brace Face' or 'Four Eyes' was bad, try listening to 'Dead Head' and 'Stubby Neck Freak' all day long. And, don't even get me started on trying to eat lunch in the cafeteria. 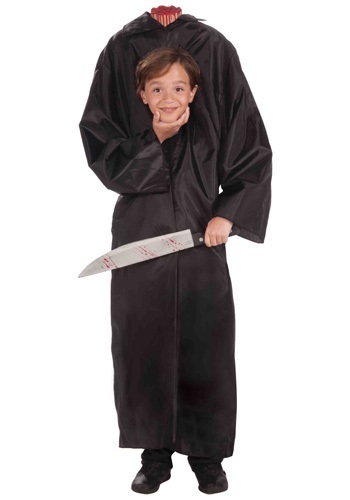 Never mind that a headless kid doesn't actually need to eat anymore -- what, with being the living dead and all. It's hard to hold a lunch tray, maneuver through the line, and carry your head all at the same time. Plus, the whole running joke that the 8th graders have about you and the infamous 'Mystery Meat' selection that the lunch ladies always serve up at the end of the month is enough to make you want to crawl into the nearest unoccupied grave. Sometimes it's easier to just skip lunch altogether, but recess is not much better. The headless kid is always the last one picked for teams, even the guy with the asthma inhaler gets picked before you. That's one of the reasons this robe is so awesome. It's long and flowing with a harness underneath to support everything. It may not be perfect, but helps you blend in with the living a little better.